Two weeks ago, we completed 2353 student involved conferences. Every one provided each student with the chance to reflect and gather feedback on his/her learning. This number shows that there is a high level of parent engagement with the objective to support learning. Several of our teachers were busy with 70+ conferences over this time. We applaud their enthusiasm and stamina. TOK is a mandatory course, as part of the IB curriculum, it asks students to reflect on the nature of knowledge, and on how we know what we claim to know. This Monday we completed the last of G12 TOK's presentations. In these presentations, our students got to choose a real-life situation and assess how the information surrounding it was perceived and what affected that. It is a great opportunity for them to learn how to acquire, process and disseminate information responsibly. The high school play is here! Black Box Theatre Company presents You Can't Take it With You, a comedy by Moss Hart and George Kaufman! You're invited to the Vanderhof home, where you will meet a collection of cheerful and erratic (yet lovable) individualists who engage in playwriting, ballet dancing, xylophone playing and firework making, among other things. Tickets are 10,000 TZS and will be available for purchase in the Drama Office or Ms. Payne in C1 on Monday, November 19. AISA GISS 2019 - Only 32 More Beds Needed! This means that we need 16 more families to open up their homes to our guests January 16-20. We are so close to being able to offer every single student a place to stay during the conference. Sign up now by going to the hosting form. You will find more details there. The Grade 11 DP Music students will be putting on a concert of solo and ensemble works. It will be held in M2 and refreshments will be available. The concert starts at 6pm on Friday December 7th. 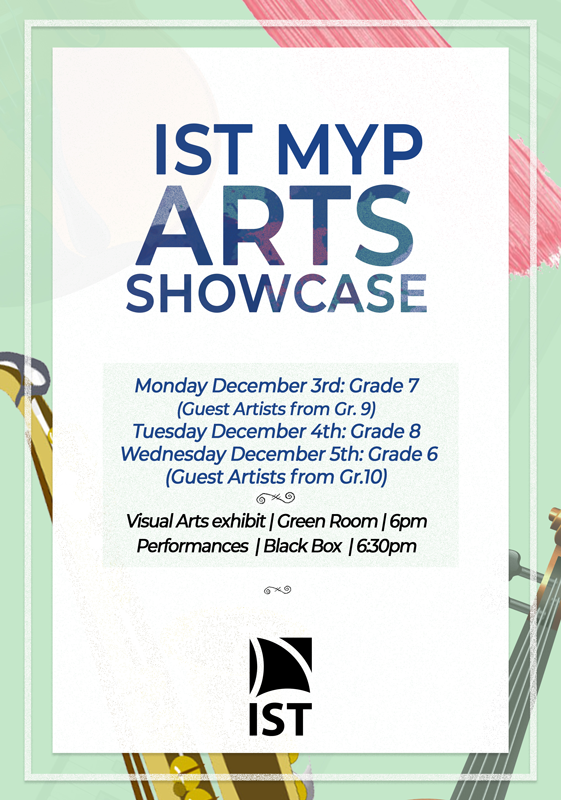 These evenings are an opportunity for MYP students to showcase the work that they have been doing in their performing and visual arts classes during the past semester. Each evening will begin with a Visual Arts Exhibition in the Green Room at 6pm and will be followed with Drama and Music performances in the BlackBox, beginning at 6:30pm. We look forward to seeing you there!